A 40-year-old-man was admitted to the emergency department for sudden dyspnoea. He had no medical history. He had given up smoking a few years back having had a cigarette consumption of 10 packs/year. He stopped drinking alcohol 2 months ago. He had been a drug (heroin and cocaine) misuser for 15 years. Methadone had been introduced as a substitution therapy since 2012. He came back from a journey to China 1 month beforehand. The day of admission, he awoke with dyspnoea and a dry cough. In the emergency room, he had no fever, and lung and cardiac auscultation was normal. Oxygen saturation was 94% and the respiratory rate was over 20/min. Laboratory findings showed an increase in the leucocyte count at 18.1 109/L. C reactive protein was normal (6.5×10−3 g/L). Arterial blood gas levels showed he had hypoxaemia (pO2 9.07 kPa at room air) and normocapnia (pCO2 5.33 kPa). The ECG showed no abnormalities. 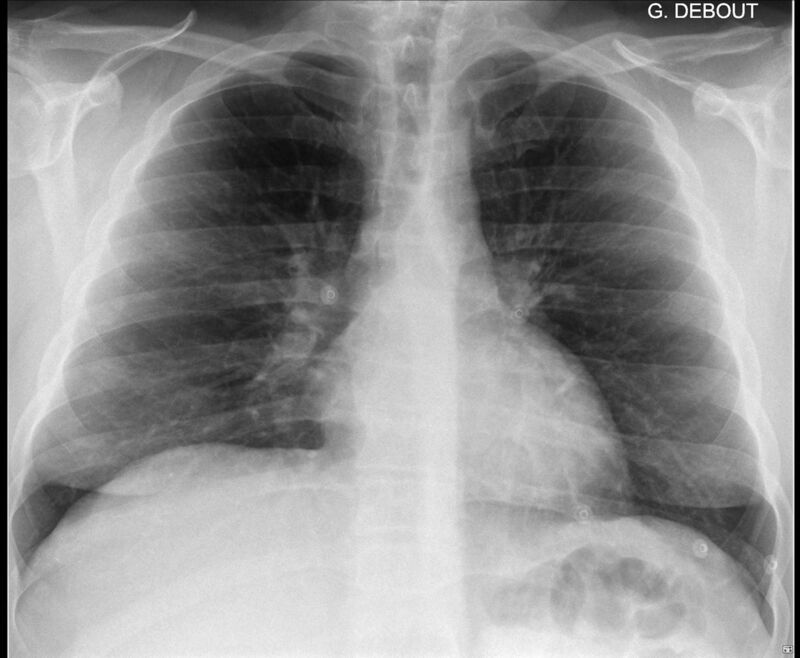 The chest radiograph was normal (figure 1). Echocardiography ruled out cardiac failure. In order to explain dyspnoea associated with hypoxaemia, a chest CT scan was performed that found diffuse and homogeneous bilateral ground glass opacities (GGOs) with a subpleural sparing area (figure 2A, B). Chest radiograph with no abnormalities. CT images of (A) upper lobes and (B) middle and lower lobes showing diffuse bilateral ground glass opacities with subpleural sparing area. The abnormalities are diffuse and homogeneous with no differences between the upper and lower lobes. For the answer see page 607. From the question on page 604. Before performing bronchoscopy, he told us that the night before, during a party, he had experienced an uncommon increase in crack inhalation. Bronchoscopy found diffuse inflammation and bronchoalveolar lavage (BAL) revealed a total cell count of 230 cells/mm3 (25% macrophages, 5% lymphocytes, 70% granulocytes). The final diagnosis was an acute pulmonary syndrome triggered by crack inhalation (also named ‘crack lung’). He rapidly improved on oral steroids. Given that the patient was a drug misuser, the first diagnosis suggested due to diffuse GGO on CT scan was a pneumocystis jiroveci pneumonia. However, HIV serology was negative and the BAL fluid analysis found no fungi. Respiratory bronchiolitis-associated interstitial lung disease, a smoke related lung disease, could be discussed but the most common CT findings associate centrilobular nodules to GGO and our patient had given up smoking several years ago.1 Eosinophilic lung diseases also need to be discussed.2 Predominant patterns on CT of acute eosinophilic pneumonia are bilateral patchy areas of GGO but frequently associated with interlobular septal thickening and consolidation. Chronic eosinophilic pneumonia involves mainly the upper lobes with typical non-segmental areas of consolidation with peripheral predominance on CT. Less common findings include GGO, nodules and reticulation. The patient history and results of BAL fluid with absence of eosinophils easily ruled out these hypotheses. Drug reactions may induce peripheral GGO on a CT scan, but methadone-induced pulmonary disease is a very rare condition. Prevalence of acute pulmonary syndrome triggered by crack inhalation is unknown. About 95% of crack users report at least one respiratory symptom in the past week and 68% described these symptoms as incommodious.3 However the majority of drug misusers do not see a doctor. Pathological findings of ‘crack lung’ are diffuse alveolar damage which explains diffuse GGO with subpleural sparing area on a CT scan.4 Mechanisms include the high temperature of volatilised impurities and the presence of non-volatilised impurities resulting in alveolar macrophage activation and diffuse alveolar damage.3 Steroids are a therapeutic option and resolution is usually rapidly obtained.